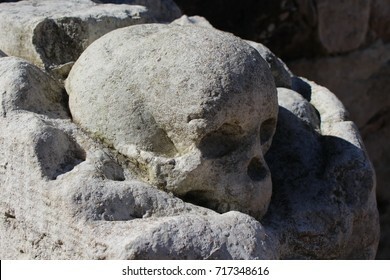 935 stock photos, vectors, and illustrations are available royalty-free. 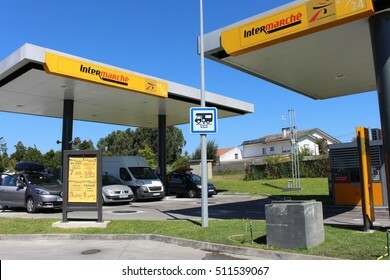 POMBAL, PORTUGAL - AUGUST 18, 2017: A Repsol gas station. 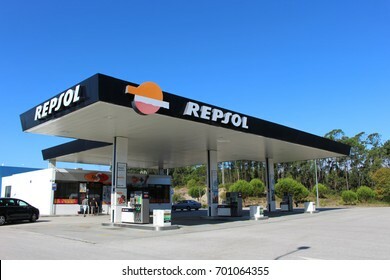 Repsol is a Spanish multinational oil and gas company based in Madrid. 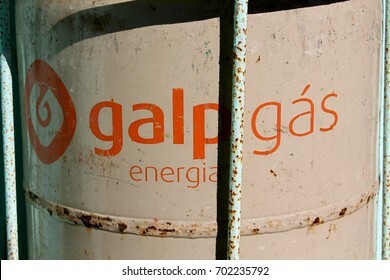 It is the 15th largest fuel refining company in the world. 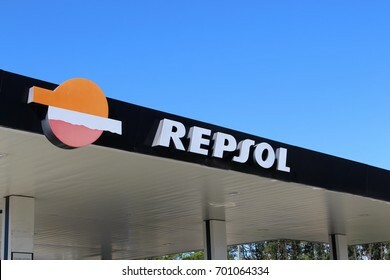 POMBAL, PORTUGAL - AUGUST 18, 2017: A Repsol logo. 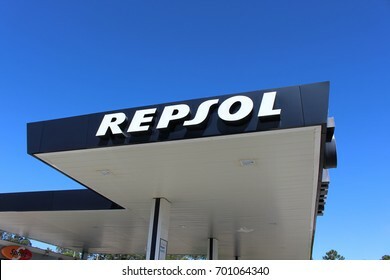 Repsol is a Spanish multinational oil and gas company based in Madrid. 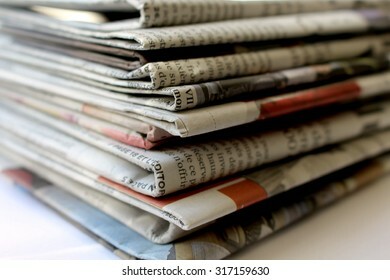 It is the 15th largest fuel refining company in the world. 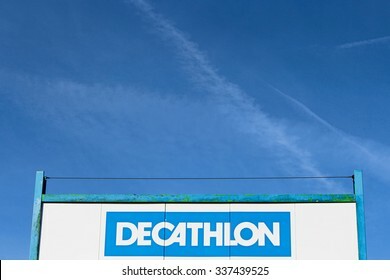 LOGNES, FRANCE - APRIL 17, 2016: Decathlon logo. 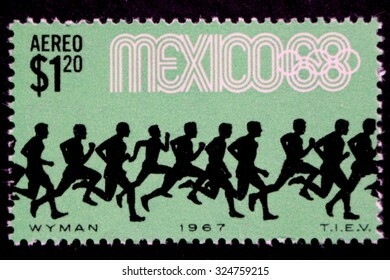 Decathlon is a French company of sporting goods distribution. It currently operates in 28 countries. ORMESSON SUR MARNE, FRANCE - NOVEMBER 8, 2015: Logo of Carrefour brand in Ormesson sur Marne, France. 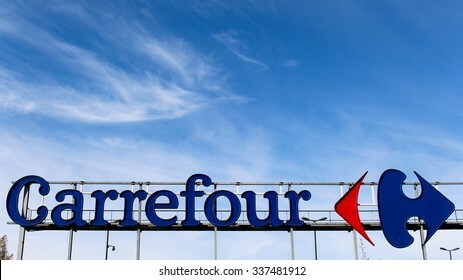 Carrefour is a chain of hypermarkets. 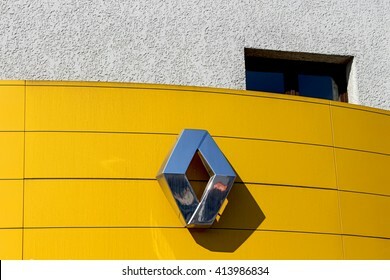 OZOIR LA FERRIERE, FRANCE - APRIL 30, 2016: Renault sign in Ozoir la Ferriere, France. 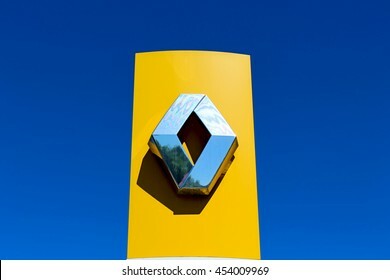 Renault is a French car manufacturer. 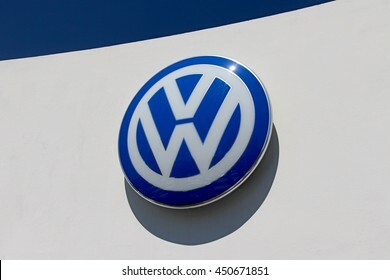 BRIE COMTE ROBERT, FRANCE - JULY 9, 2016: Volkswagen logo. 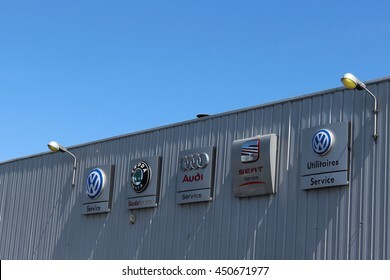 Volkswagen is a German automotive group founded in 1937. DISNEYLAND, PARIS - NOVEMBER 22, 2015: Walt Disney Studios in Disneyland Paris, France. 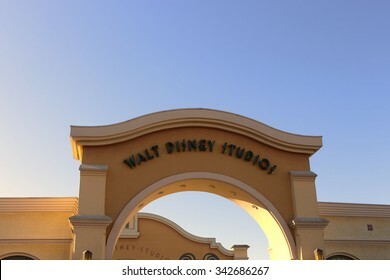 Disney is the first entertainment group in the world in 2012. SERRIS, FRANCE - MAY 8, 2016: Caddy of the Auchan brand. 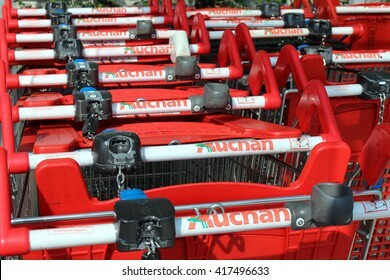 Auchan is a great French retail brand. In 2010, it is the thirteenth worldwide distributor and the second French distributor. 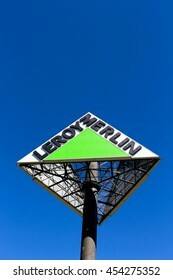 BRIE COMTE ROBERT, FRANCE - JULY 9, 2016: Leroy Merlin logo in blue sky. 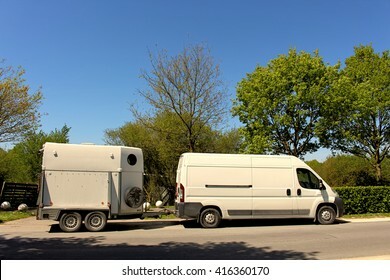 Leroy Merlin is a major French retail chain specializing in the construction, DIY and gardening. 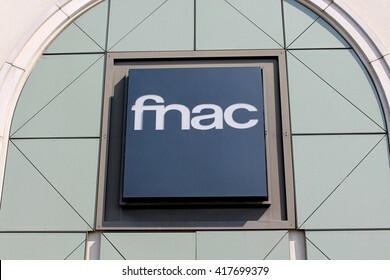 SERRIS; FRANCE - MAY 8,2016: Fnac is a French chain of stores specializing in the distribution of cultural and electronic products. CHENNEVIERES SUR MARNE - FRANCE, JULY 18, 2016: Toys "R" Us store. 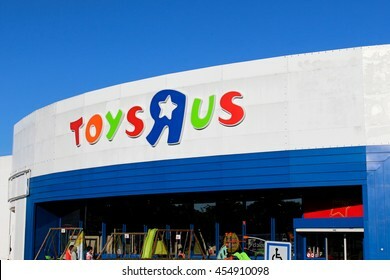 Toys "R" Us is a chain of toy shops created in the United States. 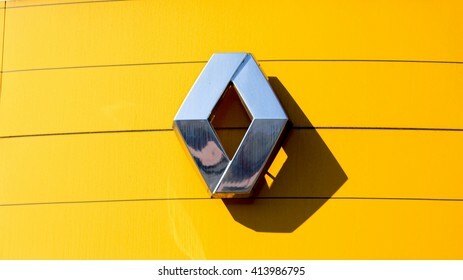 BRIE COMTE ROBERT, FRANCE - JULY 17, 2016: Renault is a French car manufacturer. 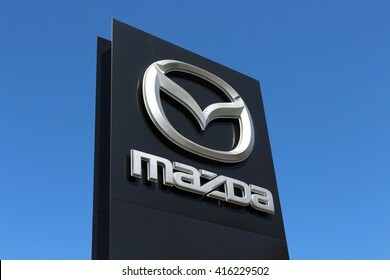 It is linked to the Japanese manufacturer Nissan since 1999. 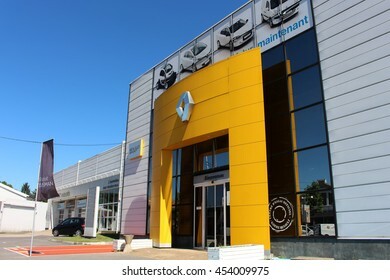 BRIE COMTE ROBERT, FRANCE - JULY 17, 2016: Renault store in Brie Comte Robert, France. 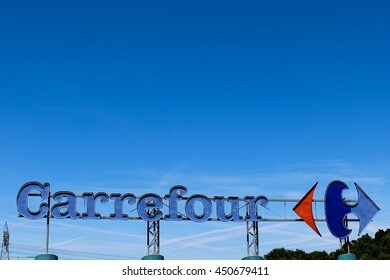 BRIE COMTE ROBERT, FRANCE - JULY 9, 2016: Carrefour is a French group of the retail sector. 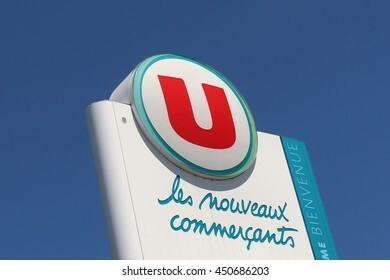 BRIE COMTE ROBERT, FRANCE - JULY 9, 2016: System U is a cooperative of French retail traders. 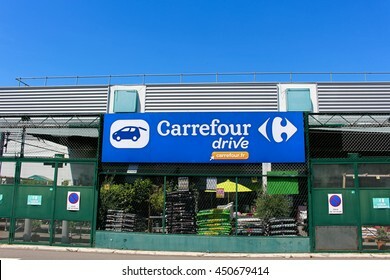 BRIE COMTE ROBERT, FRANCE - JULY 9, 2016: French international hypermarket chain Carrefour sign. 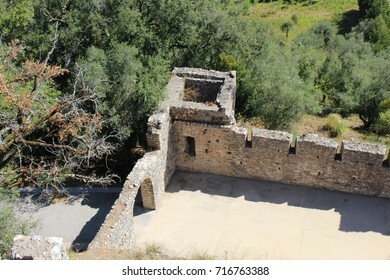 MONTEVRAIN, FRANCE - MAY 8, 2016: Darty store. 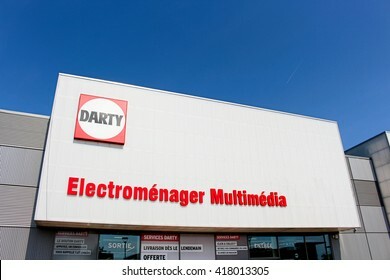 Darty is a French company specialized stores selling home appliances, computer and audiovisual equipment. 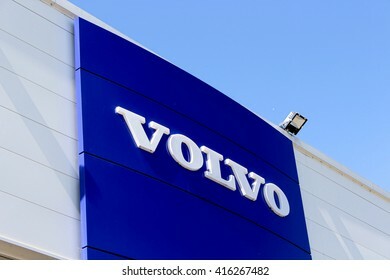 CHENNEVIERES SUR MARNE, FRANCE - MAY 5, 2016: Volvo sign. 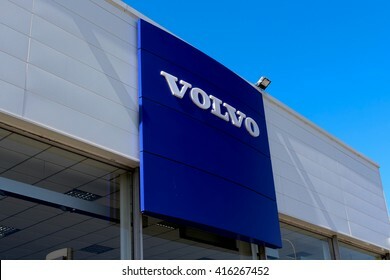 Volvo Cars is a Swedish carmaker, owned since 2010 the Chinese group Geely. VIANA DO CASTELO, PORTUGAL - AUGUST 4, 2016: Sagres sign in Portugal. 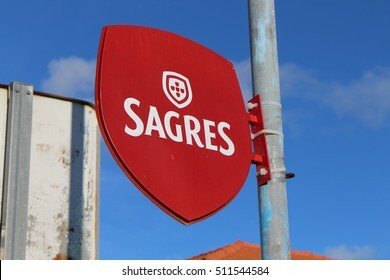 Sagres is a Portuguese beer founded in 1940. SERRIS, FRANCE - MAY 8, 2016: Desigual sign. 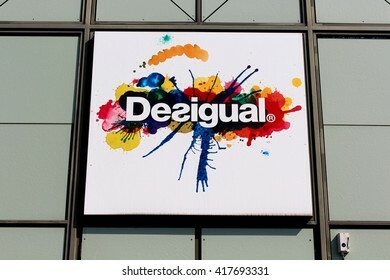 Desigual is a Spanish company of design, manufacture and distribution of clothing ready-to-wear created in 1984. 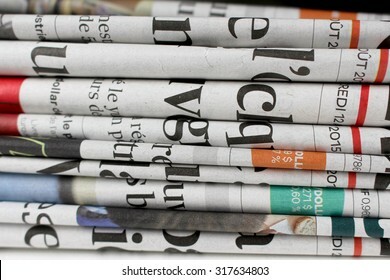 Newspapers This is a newspaper photograph stacked on each other. 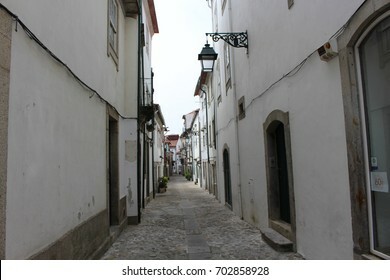 POMBAL, PORTUGAL - AUGUST 18, 2017: Courtyard. 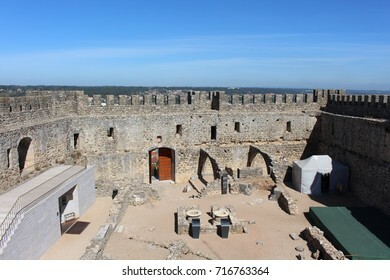 The castle of Pombal was built in 1161 by the order of the Templars. 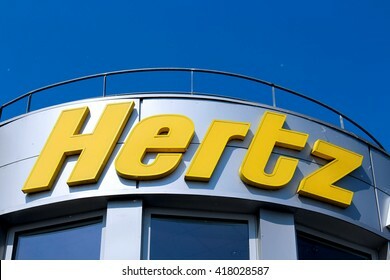 MONTEVRAIN, FRANCE - MAY 8, 2016: Hertz sign. 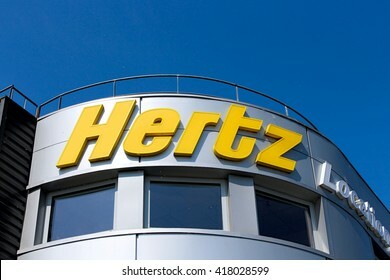 Hertz is a US vehicle leasing. 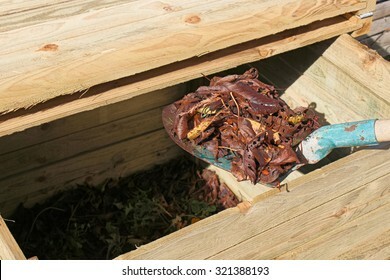 It is the world leader. 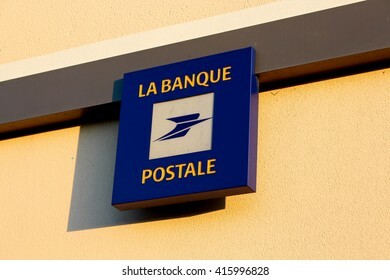 OZOIR LA FERRIERE, FRANCE - MAY 4, 2016: La Poste is a French multi-business company, both operator of postal services, banking, insurance, mobile telephony operator, digital service provider. 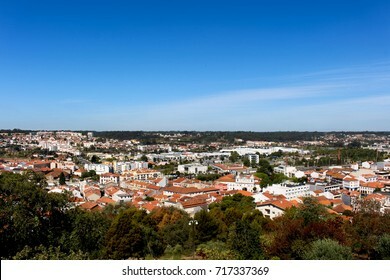 VIANA DO CASTELO, PORTUGAL - AUGUST 4, 2016: Super Bock in Portugal. 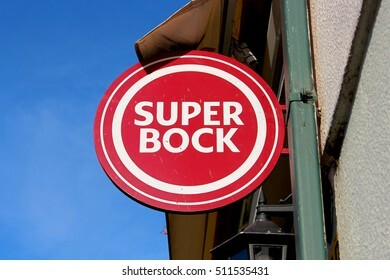 The Super Bock beer is a Portuguese based in Porto in 1927. 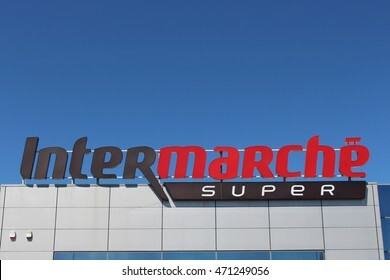 MIRA, PORTUGAL - AUGUST 8, 2016: Intermarche sign in Portugal. 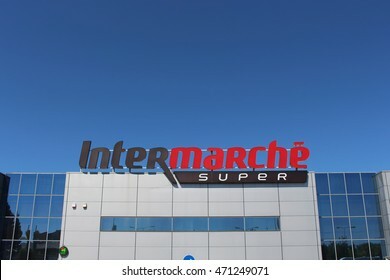 Intermarche is a French chain of supermarkets. SERRIS, FRANCE - MAY 8, 2016: La Grande Recre sign. 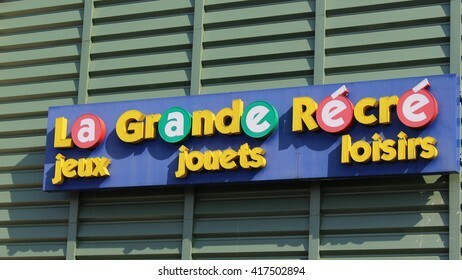 La Grande Recre is a french toy store. FERRIERES EN BRIE, FRANCE - SEPTEMBER 27, 2015: Cart oh the Casino brand in FerriÃ¨res en Brie, France. 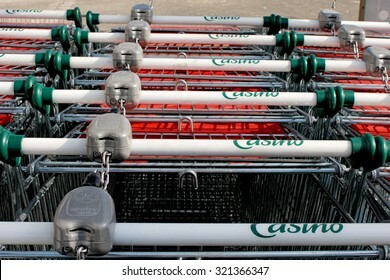 The Casino Group is a distribution group in France and in the world. 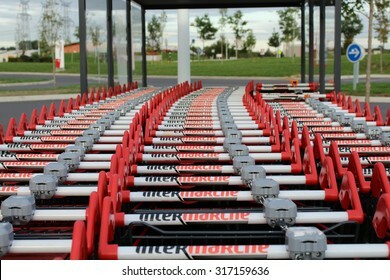 OZOIR LA FERRIERE, FRANCE - SEPTEMBER 27, 2015: Cart oh the Leclerc brand in Roissy en Brie, France. 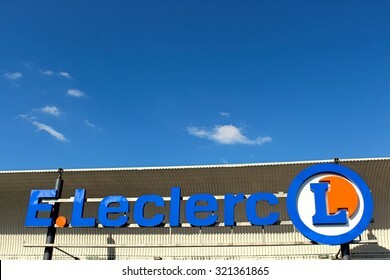 Leclerc is a large retail chain in food predominance of French origin. FERRIERES EN BRIE, FRANCE - MAY 8, 2016: Eiffage flag. 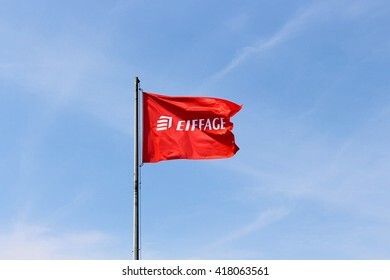 Eiffage is the third group of French construction and concessions behind Vinci and Bouygues, and the fifth European group. ROISSY EN BRIE, FRANCE - MAY 7, 2016: Credit Agricole bank. 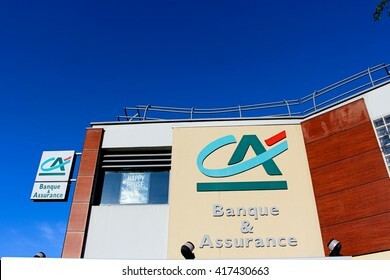 The Credit Agricole group in 2013 recorded a turnover of 26.4 billion euros. 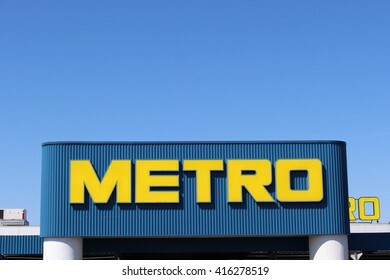 CHENNEVIERES SUR MARNE, FRANCE - MAY 5, 2016: Metro Group sign. 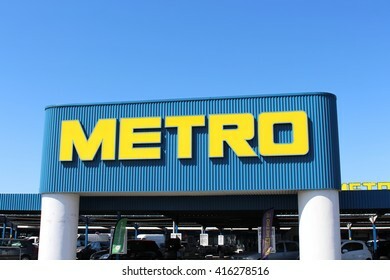 Metro Group is a German distribution group. 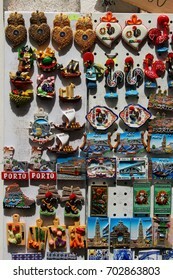 It is especially known for its wholesale stores, professionals in many countries. MIRA, PORTUGAL - AUGUST 3, 2016: Intermarche is a French brand of large distribution group Les Mousquetaires founded in 1969. 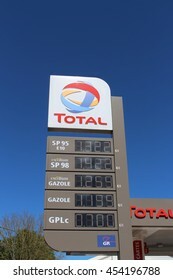 BRIE COMTE ROBERT, FRANCE - JULY 17, 2016: sign of the price of gasoline to the Total brand. BRIE COMTE ROBERT, FRANCE - JULY 17, 2016: Sign of the essence. 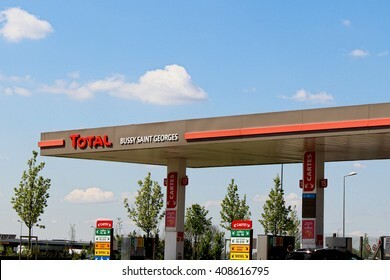 Total is a private French oil company. 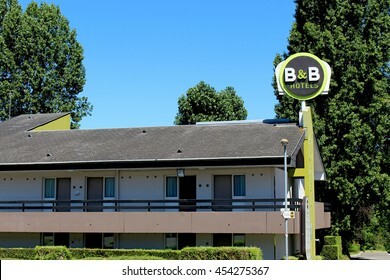 PONTAULT COMBAULT, FRANCE - JULY 17, 2016: B&B Hotel in Pontault Combault, B & B Hotels is a hotel chain founded in 1990 in Brest in France. 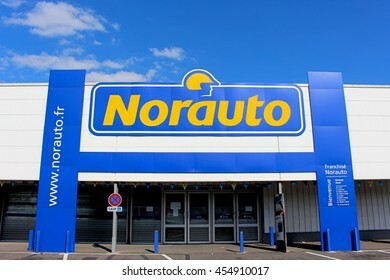 MONTEVRAIN, FRANCE - MAY 8, 2016: Peugeot store. 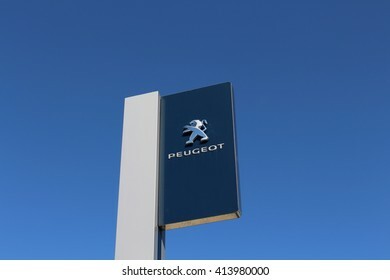 Peugeot is a French car manufacturer. 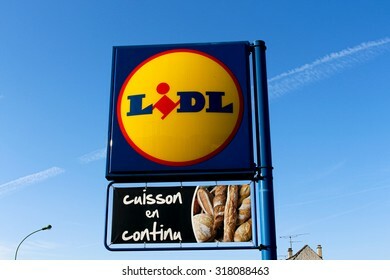 ORMESSON SUR MARNE, FRANCE - NOVEMBER 8, 2015: Logo of Lidl brand in Ormesson sur Marne. 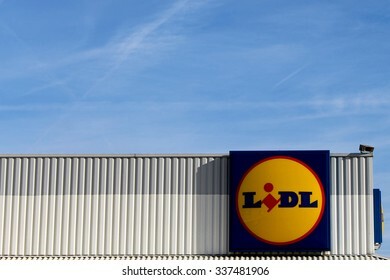 Lidl is a German hard-discount business through this twenty-six countries in Europe with 7839 stores. 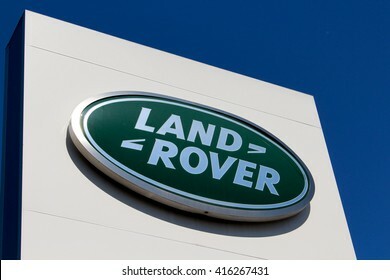 BRIE COMTE ROBERT, FRANCE - JULY 9, 2016: Logo of several car manufacturer. OZOIR LA FERRIERE, FRANCE - SEPTEMBER 5, 2015: Logo of the brand Lidl in Ozoir la Ferriere, France. 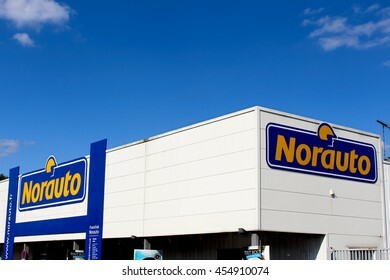 Lidl is a hard-discount business . OZOIR LA FERRIERE, FRANCE - OCTOBER 7, 2015: Box of Tylenol in ozoir la Ferriere, France. 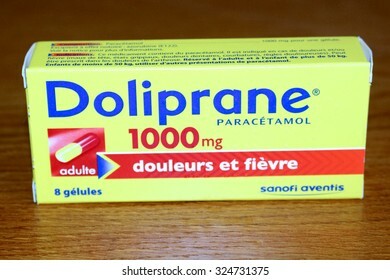 Acetaminophen is the active ingredient of many drug specialties in the class of painkillers. MONTEVRAIN, FRANCE - MAY 8, 2016: Total service station in Montevrain. 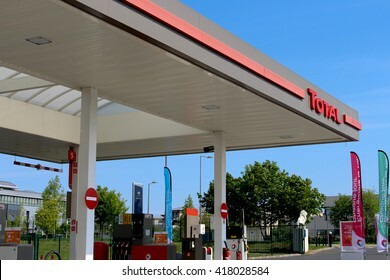 Total is a private French oil company. 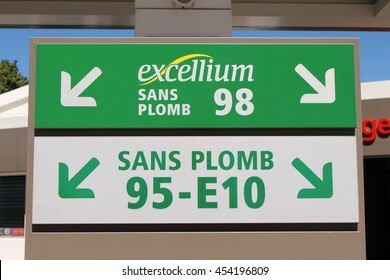 SERRIS, FRANCE - MAY 8, 2016: Habitat sign. 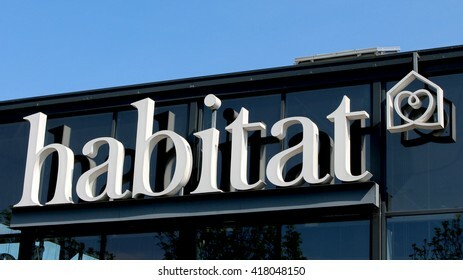 Habitat is a chain of stores specializing in the sale of furniture and contemporary decorative accessories. OZOIR LA FERRIERE, FRANCE - SEPTEMBER 27, 2015: Logo of Lelcerc brand in Ozoir la FerriÃ¨e, France. 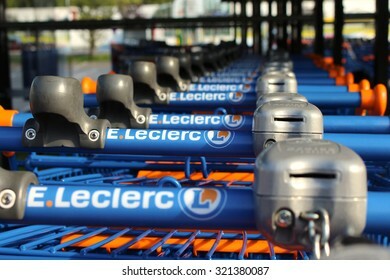 Leclerc is a large retail chain in food predominance of French origin. VILLIERS SUR MARNE - FRANCE, JULY 20, 2016: Ikea sign. 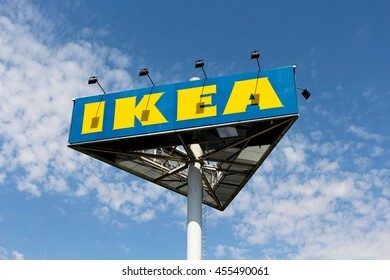 IKEA is a Swedish company specializing in the design and retail of furniture and decorative items ready to install or mount kit. 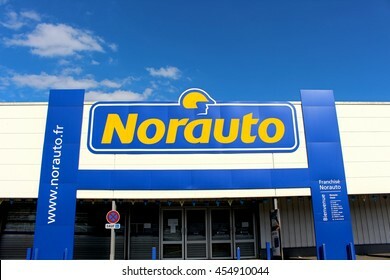 OZOIR LA FERRIERE, FRANCE - JULY 17, 2016: Norauto is a French group specializing in automotive fast repair, maintenance and automotive equipment. 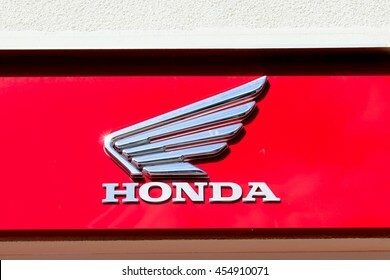 OZOIR LA FERRIERE, FRANCE - JULY 17, 2016: Honda is a car manufacturer, trucks, motorcycles and scooters as well as business aircraft. BRIE COMTE ROBERT, FRANCE - JULY 17, 2016: Citroen is a French automobile manufacturer. 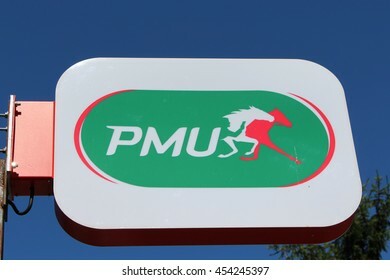 BRIE COMTE ROBERT, FRANCE - JULY 17, 2016: PMU sign. 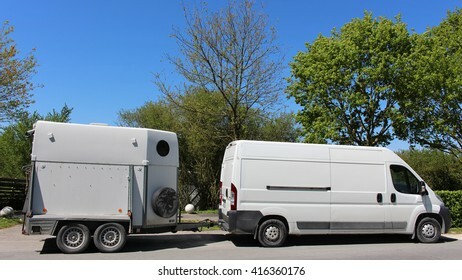 PMU is a French company paris horse whose activities are the design, promotion, marketing and processing of paris on horse races. 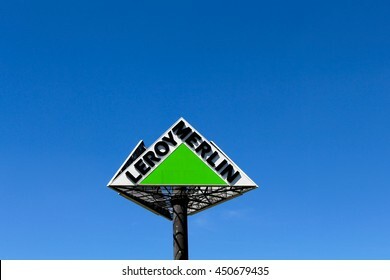 BRIE COMTE ROBERT, FRANCE - JULY 17, 2016: Leroy Merlin is a major French retail chain specializing in the construction, DIY and gardening. 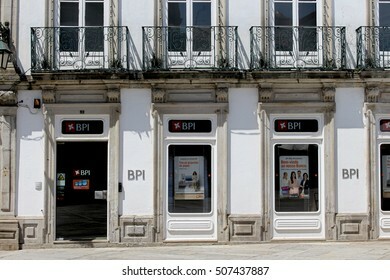 VIANA DO CASTELO, PORTUGAL - AUGUST 5, 2016::BPI bank in Portugal. 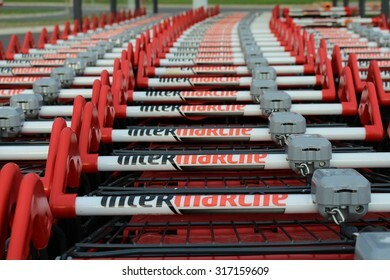 ROISSY EN BRIE, FRANCE - SEPTEMBER 8, 2015: Cart of the Intermarche brand in Roissy en Brie, France. In 2012, Intermarche has 1,803 sales outlets in France and nearly 2,300 in Europe. SERRIS, FRANCE - APRIL 18, 2016: Logo of H&M brand. 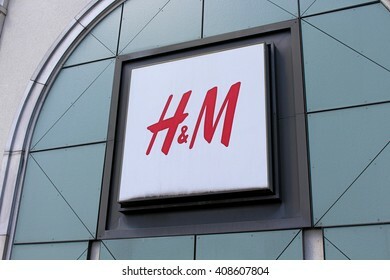 H&M is a business and chain stores of Swedish ready-to-wear for woman, child and man, was established in 1947. SERRIS, FRANCE - APRIL 18, 2016: Logo of Zara brand. 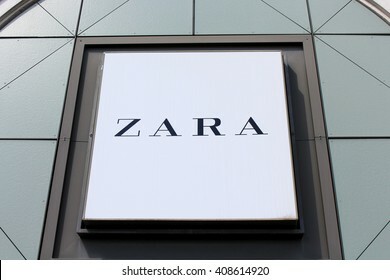 Zara is the leading clothing retail chain of the Spanish group Inditex. BUSSY SAINT GEORGES, FRANCE - APRIL 18, 2016: Total service station in Bussy Saint Georges, France. 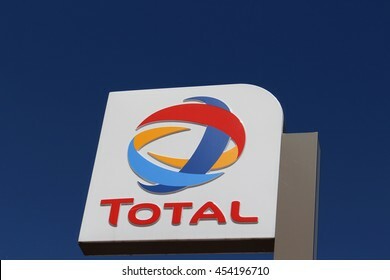 Total is a private French oil company. BRIE COMTE ROBERT, FRANCE - JULY 9, 2016: McDonald's sign. 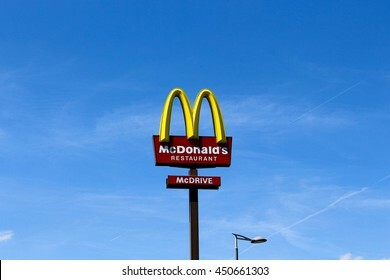 McDonald's is the world's largest chain of hamburger fast food restaurants. BRIE COMTE ROBERT, FRANCE - JULY 9, 2016: Carrefour drive store. 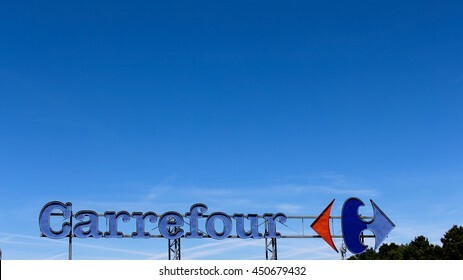 Carrefour is a French group of the retail sector. 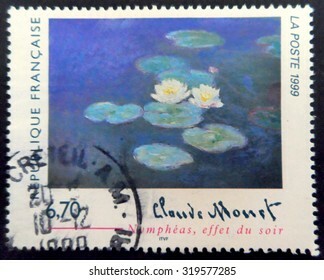 FRANCE - CIRCA 1999: A postage stamp printed in France showing an image of a work by the painter Claude Monet entitled Water Lilies, Evening Effect, circa 1999. MONTEVRAIN, FRANCE - MAY 8, 2016: Val d'Europe shopping center. 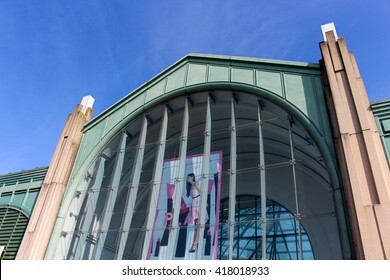 Val d'Europe is a commercial and entertainment center of Eastern Paris located in the municipality of Serris, in Seine-et-Marne. MONTEVRAIN, FRANCE - MAY 8, 2016: Boulanger sign. 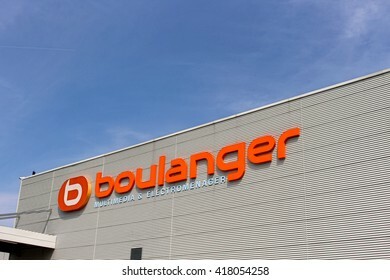 Boulanger is a French brand specializing in leisure, multimedia and household appliances. 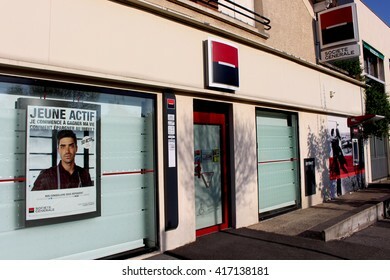 OZOIR LA FERRIERE, FRANCE - MAY 7, 2016: Societe Generale bank. Societe Generale is one of the main French banks and one of the oldest. PONTAULT COMBAULT, FRANCE - MAY 5, 2016: Logo of Courtepaille brand in France. 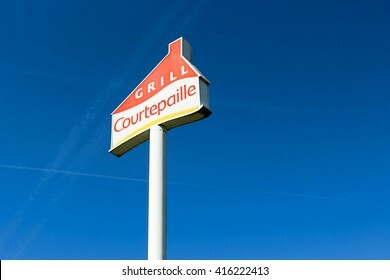 Courtepaille is a French chain of restaurants specializing in grilled meat. 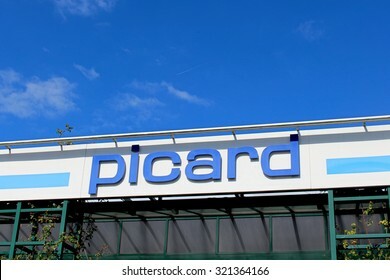 ROISSY EN BRIE, FRANCE - MAY 4, 2016: Store Point P in France. 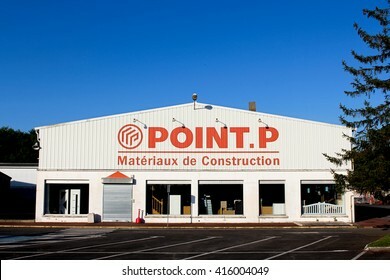 Point P is a French company specialized in the production, processing and distribution of materials. OZOIR LA FERRIERE, FRANCE - APRIL 30, 2016: Peugeot sign in Ozoir la Ferriere, France. 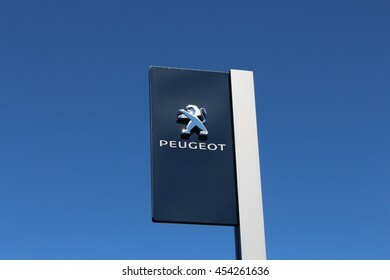 Peugeot is a French car manufacturer . PONTAULT COMBAULT, FRANCE - NOVEMBER 8, 2015: Logo of Decathlon brand in Pontault Combault, France. 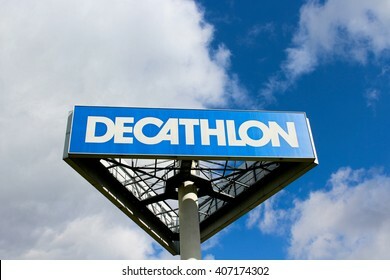 Decathlon is a French company of sporting goods distribution. It currently operates in 21 countries. 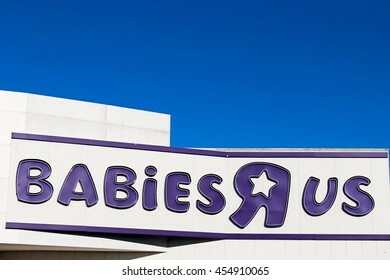 CHENNEVIERES SUR MARNE - FRANCE, JULY 18, 2016: Babies "R" Us is a chain of toy shops created in the United States. 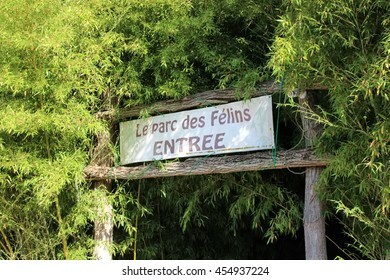 LUMIGNY NESLES ORMEAUX - FRANCE, JULY 15: 2016: The Felins Park is a zoo in France. He has cats and lemurs. 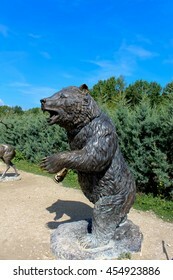 It shows 30 species and various subspecies. It hosts about 140 cats. 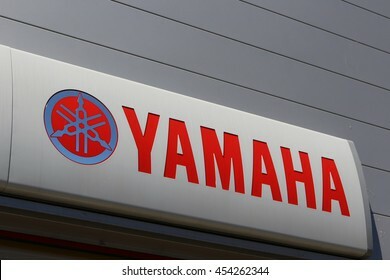 BRIE COMTE ROBERT, FRANCE - JULY 17, 2016: Yamaha sign in Brie Comte Robert, France. 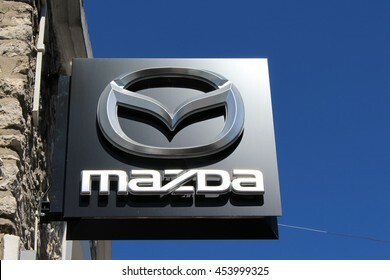 BRIE COMTE ROBERT, FRANCE - JULY 17, 2016: Mazda Motor Corporation is a Japanese automaker. BRIE COMTE ROBERT, FRANCE - JULY 17, 2016: Citroen store in Brie Comte Robert, France. 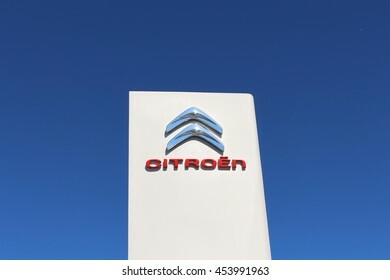 BRIE COMTE ROBERT, FRANCE - JULY 17, 2016: Citroen logo in blue sky in France. 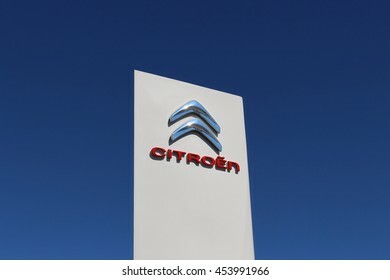 Citroen is a French automobile manufacturer. 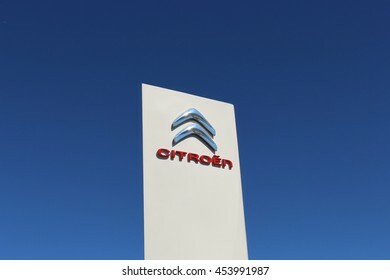 BRIE COMTE ROBERT, FRANCE - JULY 17, 2016: Citroen logo in France. 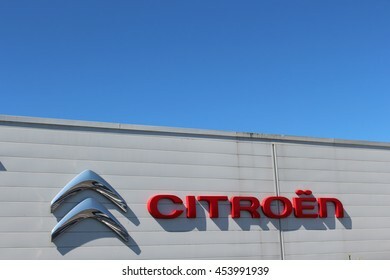 Citroen is a French automobile manufacturer. BRIE COMTE ROBERT, FRANCE - JULY 17, 2016: Matmut sign. 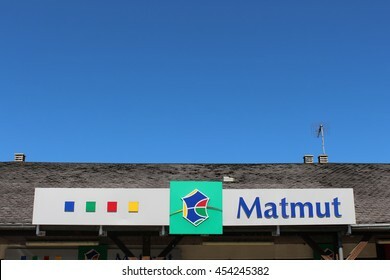 Matmut "Mutual Insurance Mutual workers" is a mutual insurance company. BRIE COMTE ROBERT, FRANCE - JULY 17, 2016: PMU logo. 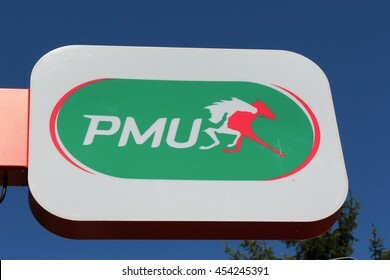 PMU is a French company paris horse whose activities are the design, promotion, marketing and processing of paris on horse races. 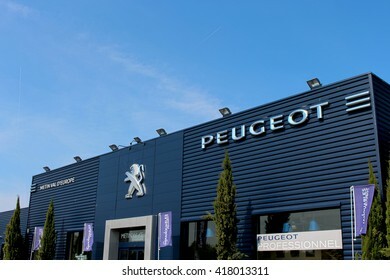 BRIE COMTE ROBERT, FRANCE - JULY 17, 2016: Peugeot is a French car manufacturer.